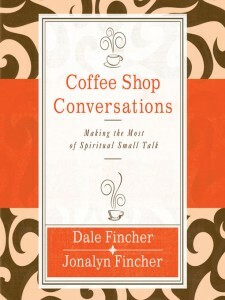 I was encouraged enough by the title Coffee Shop Conversations: making the most of spiritual small talk that I asked for a copy to review. This is the latest of my periodic reviews for the Speakeasy Blog Network. I am not reviewing books at the rate I used to; 2 small children and a new appointment has changed my priorities, and, frankly, the time available. I figured this one would be worth my time, though, as I am intensely interested in communicating the gospel. Unlike some collaborative writing, I had no trouble shifting between Dale’s and Jonalyn’s parts of the book. The flow was easy to follow and fairly seamless. Conversational style will draw you forward through this book. The Finchers admirably identify some phrases and attitudes Christians ought to retire from our conversations, as well as some mountains we’ve made of molehills, and vice versa. If you are interested in sharing our faith with others in ways that might help them hear and accept, this book is worth your read. follow these seven (pick a number, any number) steps to prove your doctrinal point! To be fair, nothing anywhere in the book leads me to believe that the Finchers are anything but respectful and open to what others have to say. There are some bits here and there with which I take issue, but, following their lead, these would be things to discuss over a cup of coffee, not to blast about in a blog. Their aim, clearly stated, is to help others towards a flourishing faith. On this, I am with them 100%.